"We have to get used to the thought that companies are much more dependent on their best employees than the good people from the company" (Drucker, P. 2002: pp. 1). Today companies in nearly all industries have compete with many problems. Ex- amples for these problems are the demographic change, increased competitive pres- sure, skills shortage or the decrease of employee loyalty. These problems can be handle with staff retention. Because of the demographic development it will be very difficult for companies to get suitable professionals and managers and retain them at the company for the long term. It weighs especially for small and medium size com- panies, since the big firms are very attractive for qualified employees, because they offer them the opportunity for advancement respectively career possibilities (cf. 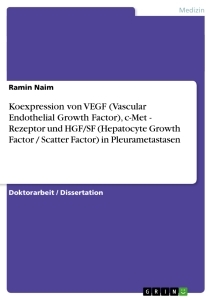 http://www.leuphana.de: pp. 7). The satisfaction of the employees is very important for the staff retention, therefore the employer should care about support the satisfaction of the employees. Because only satisfied employees are loyal to the employer and retain for longer periods to the company. “Not the preferably elegant reduction of “human capacity” but the commitment to the company will be an increased challenge” (China 2006: pp. 30). The main purpose of the study is to describe how the employee especially high qualified employees could retain to the company. It has to verify which strategies, methods and tools could ap- pointed to bind the employees to the company. Also the economic sight has to show an investment to a retention management. 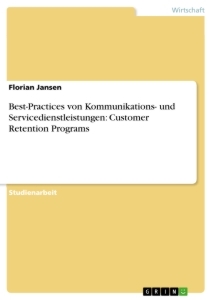 This study shall as a concept for a suc- cessful strategy of staff retention, both for the business philosophy and for the eco- nomic perspective. This paper has the goal to analyze the issue staff retention. It subdivides in five chapters. 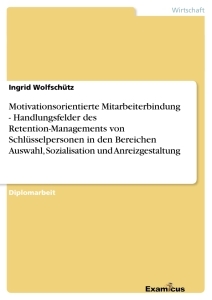 In the first chapter the problems of non-available staff retention and the goal of the paper are described. 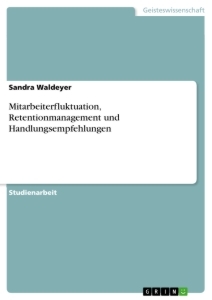 The second chapter begins with the definition of the term staff retention. Following this the objectives of staff retention in companies and which reasons the companies have to implement the staff retention are described. 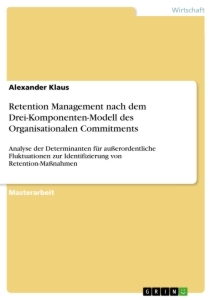 In the third chapter the instruments of commitment are described and the target which companies want to retain the employees for example with material or immaterial inducements. In the fourth chapter the factors which lead to staff retention are elucidated. To these factors belong the employee satisfaction, the connectedness and the restriction of employees to their company and the study of the satisfaction gap of employees. The last chapter describes the important results of the paper, an overview of staff retention in the future and last but not least the conclusion of this paper. Staff retention is defined as win and keep qualified employees through positive influ- ences. The staff retention is responsible for the relation between company and em- ployee. Therefore there are two perspectives the first of it is the perspective from sight of the company and the second is the perspective from sight of the employee. The company has defined specific measures to deploy retention management. The theme of staff retention will find in the question which reasons lead to retain the em- ployee in company. This question can be answered by considering and analyzing the perspective of the employees from psychological point of view (cf. Krill 2014: pp. 21). - Since a company get more staff which take place by personal fluctuation it results to personal costs and personal expenses for example costs for advertisements, proportional costs of personal department, costs for recruitment tests and job in- terviews, the long and cost-intensive training etc. which can reach about 50.000 €. Due to its very important to invest a lot of money to professional personal acquisi- tion. - Qualified employees especially high qualified employees are a factor of success for each company. Since nowadays there is a deficiency of high qualified employ- ees it’s very important to keep the employed colleagues. - In the induction phase of a new hired colleague the efficiency of the work is very small. The reason for this is that the colleague taught about the real task and in addition the organizational labor standards. The cost-intensive induction phase is more rentable if a colleague stays longer in the company. - The personal fluctuation leads to inefficiency if colleagues leaving the company and this reflect negatively on the work climate and this irritated and insecure the employees. - With new employees there is the danger that they can’t bring the same quality of performance as their predecessor or this isn’t suitable to the business culture. That means it’s not only the follow-up costs which result but even a reduction of performance quality takes place. - The personal fluctuation causes the loss of know-how for the company. Because the colleagues who leave the company pick up all the information and the knowledge which is adopted recently in the company. 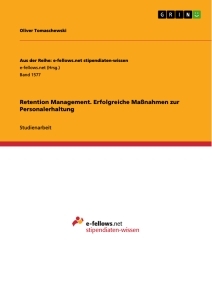 The disadvantages of personal fluctuation can be avoided with the introduction of retention management. Because the introduction of retention management is cheaper than the results of personal fluctuation (cf. Bröckermann/Pepels 1992: pp. 131). Companies intend to use of staff retention to reach the objectives of the company. The target of staff retention is to increase the business success by reducing costs and thus achieve an advantage over the competition. This business objectives are usually portrayed as performance indicators such as profits, turnover or staff productivity. This success of the company can be achieved by the avoidance and reduction of employee fluctuation (cf. Krill 2014: pp. 75). 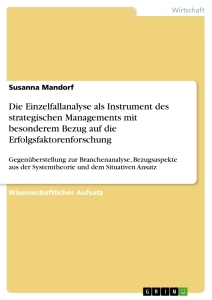 The target of staff retention show after long-term perspective in the business suc- cess, because in most cases you cannot expect the profitability of staff retention quickly. 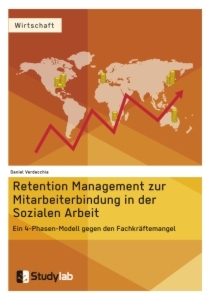 The investigation of Reichheld shows that the retention of employees lead to increase the business success. The annual employee contribution increases with the length of membership in the company. In Illustration 1 you can see the result of ten years analysis of companies in different sectors (cf. Reichheld 1997: pp. 125). There is watching, that after recruitment investment in the employee is hardly to be expected to contribute for the company, for this reason is the balk in the negative field (Illustration 1). Only with the training can the employee contribute something to the company this is because that the long-standing employees give their knowledge to the new employees and from this result surrendered that the company have no additional training costs (cf. Reichheld 1997: pp. 125). With increasing experience of the employees, increases the efficiency at work, the positive consequence of this is that the employee must be less controlled (cf. Reichheld 1997: pp. 126). Illustration 1: Yearly employee contribution in dependence on the corporate membership (Reichheld 1997: pp. 125). According to Reichheld are longtime seller are better in that to acquire new custom- ers then new seller. For new contracts to be completed by new insurance agents of- ten have a short duration and thus also for the insurance companies a deficit. Expe- rienced employees achieve a high loyalty by the customers which leads to customer loyalty. Because the work of loyal employees lead to that the customers are satisfied and this in turn lead to the recommendation by the customer. The employee recom- mendation has the advantage that companies can obtain highly qualified employees easier and cheaper. This shows that long-standing employees perform a high contri- bution to the company and thus also from an economic perspective are useful for the company (cf. Reichheld 1997: pp. 126).